Call me crazy but this seems pretty good in Pox. 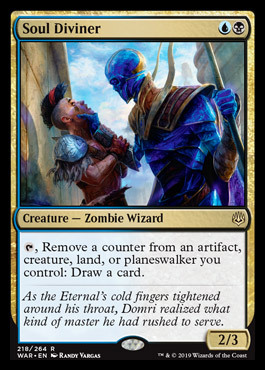 Surgical/Extirpate have both been in/out of maindeck in pox lists before and this has additional use. Not saying this is as good as extirpate/surgical, but discard is a foundational part of Pox's plan. Sometimes that plan backfires. it turns off fetches, so it's pretty cool. fringe playable, but a really cool sb card vs graveyard based decks. So, basically, WOTC wanted to give Bolas some Yawgmoth level cards? 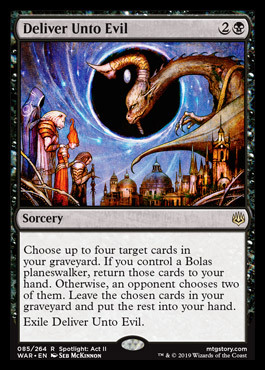 Bolas's Citadel is almost Yawgmoth's Bargain and Deliver Unto Evil is almost Yawgmoth's Will. And also, when did WOTC start filling up standard with combo cards? I hope this is a new direction they are going with their cards. As a long time MTG player, let me just say, I love this set. War of the Spark is the best set I've seen in years. How many cards do you all think will see play in Legacy? Including both tier one and tier two fringe decks? 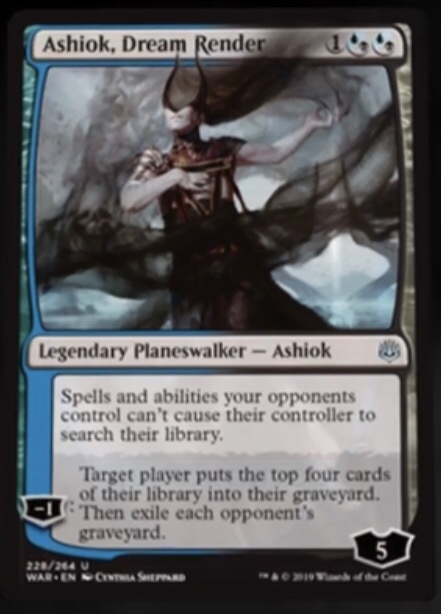 I would say at least, Bolas's Citadel, Deliver Unto Evil, Karn the Great Creator, Angrath's Rampage, Jace Wielder of Mysteries, God Eternal Kefnet, Explosion Zone, Ilharg the Raze Boar, Teferi Time Raveler. Build around cards for Arena post-Modern format IMO. Without these cards the format would be super boring and have no meta-diversity. Absolutely Liliana's Triumph as well. Other contenders (some are more keep an eye on for future synergies) are Tomik, Saheeli, Dovin, Neoform, Ral, and Flux Channeler. This card has some sweet art. It reminds me of some of that old-school art from the sets prior to Urza's Block, when they had all kinds of different artists with their own personal styles generating really unique hand-drawn fantasy art. Bolas's Citadel with Goblin Welder, Lotus Petal, LED, Mox Opal, Rituals, etc? Maybe with belcher and just 1 or 2 lands. Welder just here if they counter belcher or Citadel. Belcher does not want Citadel. Belcher wants the namesake card and a bunch of rituals in the opening hand and to go off turn one. Also Belcher does not want Welder. I can see Citadel in a more Cheerios/Storm deck. Now we can turn Dark Depths into a draw engine! Jokes aside, what are "bad" counters to feed this? Age counters? Sinking Feeling was the closest I found to turning this into an engine. Unfortunately, it doesn't go infinite because it costs 1 to activate. This is definitely the highest power level set that we've had in a while. Multiple Legacy playables plus a ton of cool fringe stuff that might see some play. Good find. : Draw a card is pretty decent, but then you're running an aura. As for combos, Glen Elendra Archmage might be interesting in that regard to set up a soft lock.